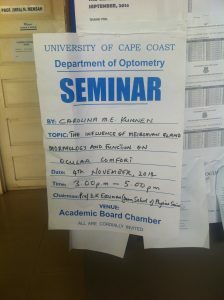 Our chairman, Carolina Kunnen, visited Ghana in October 2014 to give a seminar on her PhD research ‘the influence of the influence of Meibomian gland morphology and function on ocular comfort’. The presentation was very well received and attended by the provost, dean and director, as well as the optometry, chemistry and physics students. It had made a suitable impression, because after the seminar, a journalist of the university interviewed Carolina. Prof. Natalia Mensah (Director of Optometry Training) found the seminar very inspiring for the students and she was hoping The Optical Foundation would organise more of these seminars in the future. This is exactly in line with the foundation’s plans. Since our last project in Ghana, there have been a few changes at the University of Cape Coast. Dr. Godwin Ovenseri-Ogbomo, our previous project coordinator was unfortunately no longer working in Cape Coast but was now focused on his PhD research in Nigeria. Also Dr. Owusu, who was the director of the optometry school, had since moved into a different position. The Optical Foundation has always stayed in touch with our former students. We were proud to hear that one of our top-students, Heinz Otchere, had completed his masters at the University of Waterloo, Canada and immediately returned back to Ghana. Heinz organised an appointment for Carolina with the new Director of Optometry Training, Prof Natalia Mensah. This was the start of a productive and fruitful collaboration between Heinz, the new Director of Optometry and The Optical Foundation, all sharing the common goal of improving the quality of optometry education in Ghana. While studying in Australia, Carolina met Dr. George Afenyo, who at the time was a part-time Masters student at the University of New South Wales in Australia. George lives in Accra and in addition to doing his masters, he is working as an optometrist in the largest university hospital in Ghana – the Korle-Bu Hospital. On this visit Corolina was introduced to George’s colleague, Dr Samuel Asiedi, the chair of the Ghanaian optometry association. Dr Samuel was very impressed with the work of The Optical Foundation and expressed that he would like to start collaborating with our Foundation. Through this partnership, the Foundation is able to further accelerate the development of the Ghanaian national eye care and optometry education. Carolina also travelled to the Ashanti Region to visit the Anglican eye clinic in Jachie (a village near Kumasi). This eye clinic headed by Sister Aba – a Ghanaian ophthalmic nurse – now has a total of 25 staff members, including three optometrists. The eye clinic offers free eye care to communities around Jachie. Our volunteers offer the clinic a helping hand from time to time. Currently, The Optical Foundation, Sister Aba and the three optometrists are in the process of setting up a scientific research project. While in Ghana, Carolina met with George Weir, the president of the ‘Tomorrow Stars’, which is an organisation that provides scholarships to Ghana’s top students. George mentioned that one of his top students was a third-year optometry student at the University of Cape Coast. Francis, the student in question, proved to be very involved and wanted to organize a screening in his village. Carolina couldn’t help but become very excited by this local initiative and really wants to encourage and support this kind of initiative. In collaboration with Tomorrow Stars, The Optical Foundation is going to facilitate these screenings, however Francis will be in charge of the important organisational responsibility of this project. This opportunity will give him a platform to significantly grow professionally under the guidance of The Optical Foundation. Another local initiative was started by Hakeem, a former student of The Optical Foundation. Esma, who had trained Hakeem in 2011, was very enthusiastic about him at that time. His World Eye Foundation provides eye screening in Ghana. The Optical Foundation would like to collaborate with Hakeem and his organisation, by organising screenings together. It is very nice to observe that there are many new initiatives from the Ghanaian optometrists themselves. Unfortunately it took longer to ship the screening equipment than expected, and since Carolina had to return to Australia, Salem Alameddine, a friend of the foundation, taking on all the organisational efforts to ensure follow up and receipt of the incoming shipment of equipment. The Optical Foundation is extremely grateful to Salem for him organising this all at such short notice. In the meantime all the equipment has arrived in Ghana and is ready for the next volunteer.